It’s tough to resist eating Halloween Candy. 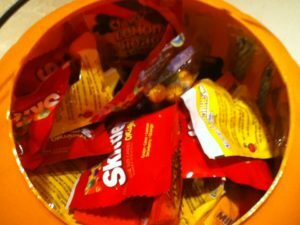 I know I have been munching away on all the candy bought to give out to all the trick-or-treaters on Halloween Night. Butterfinger – 280 calories and 10 grams of fat, including 5 grams of saturated fat. Hydrogenated fat is the worst thing you can eat. Hydrogenated oils boost your chances of developing chronic diseases such as heart disease. If you are craving for chocolate, grab a box of Smarties or an Aero bar. Tootsie Rolls – 140 calories, 3 grams of fat, including 0.5 grams of saturated fat of fat. Tootsie rolls are lower in calories but you should stay away from candies with trans fat. Just one serving of Tootsie Rolls contains 1 gram of trans fat. Cheezies – One serving of Humpty Dumpty Cheese Sticks has 290 calories, 21 grams of fat, including 2 grams of saturated fat. Cheezies are full of sodium and fat and they turn your fingers orange, so that can’t be natural. Reach for a bag of baked chips instead. Potato Chips – One serving of Old Dutch Regular Chips has 260 calories, 14 grams of fat, including 1 gram of saturated fat. Potato chips are packed with fat and sodium. They to reach for a bad of baked chips instead. One serving of Old Dutch’s Original baked chips has 190 calories and 2.5 grams of fat. I big difference then the regular deep fried chips. Laffy Taffy, Airheads, caramel apples can harm your teeth and expensive dental work. They tend to stick to your teeth which may lead to cavities. Instead reach for fast dissolving candies like Pop Rocks, Nerds or lollipops. The cute little pumpkin-shaped chocolates that you find in your trick-or-treat bag are usually made from low-quality chocolate. They often lack flavour, which can lead you to over eat. Because they are all individually wrapped you don’t know the ingredients or nutrition information. You should grab a high-quality chocolate like a Lindt truffle ball to satisfy your craving. Butterfingers are actually one of my favorites because I never eat them during the year. But…I always go for dark chocolate first! Is it bad that I’ve never tried a Butterfinger before? !